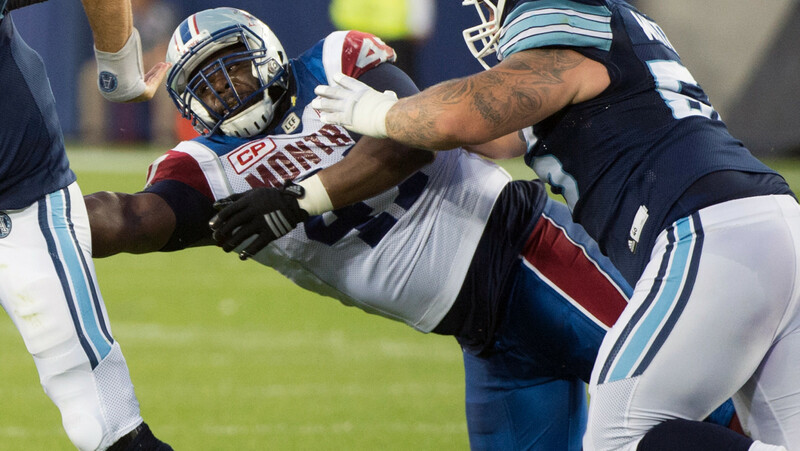 MONTREAL — The Montreal Alouettes have released defensive tackle Vaughn Martin, according to multiple reports. According to Jim Popp, DT Vaughn Martin requested his release after #Als failed to arrange a trade. Denied it was salary cap related. The 6-foot-4, 300-pound interior lineman signed a two-year deal with the Alouettes back in February following a seven-year career in the National Football League. Now 30, Martin was originally drafted in the fourth round of the 2009 NFL Draft by the San Diego Chargers. Born in Negril, Jamaica, Martin was drafted in the fifth round (39th overall) by the Alouettes in the 2011 CFL Canadian Draft. Growing up in Ontario, Martin played CIS football with the Western Ontario University Mustangs. In 12 games during his last season with the Mustnags in 2008, he collected 36 tackles including 3.5 sacks and 7.5 tackles for losses while returning an interception for a touchdown, forcing a fumble and recovering two. Prior to his university career, he helped team Canada win the 2006 NFL World Global championship in Detroit with a 5-0 record. He was named to the All-tournament team. Martin recorded eight tackles in seven games for the Alouettes starting alongside Alan-Michael Cash on the inside of the Montreal defensive line.